We wouldn’t normally go into this much detail and put out a fund specific update about the thinking behind the introduction of a fund, but we thought in this case it might be warranted especially given the market conditions. There are endless discussions about active versus passive management, active share and closet tracking, to name but a few of the labels applied to some of the factors of investing in equities. 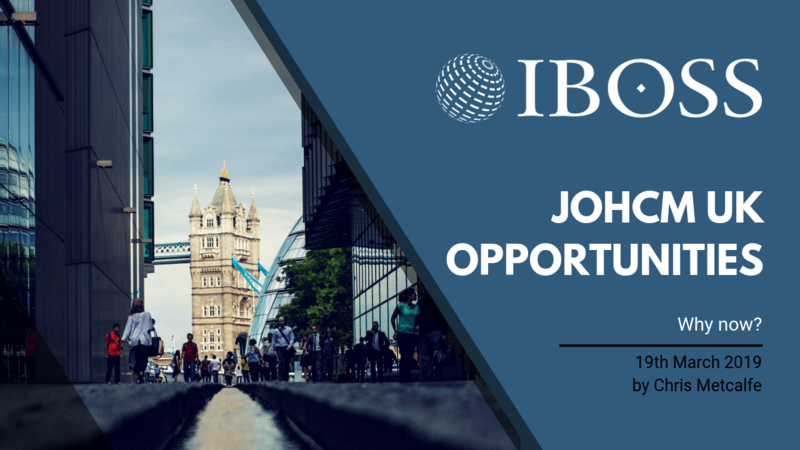 We have held the JOHCM UK Opportunities fund in the IBOSS portfolios in the past, however chose to remove the fund for two main reasons – fund size and a potential change in fund manager. The previous manager, John Wood, was approaching retirement at the time. We tend to see this, rightly or wrongly, as a cause for concern regardless of who is taking over the fund. In this case John’s replacement was Rachel Reutter who has been working on the fund since joining JOHCM in 2012 but who had not been named lead manager on a fund previously. Currently she co-manages the fund with the experienced Michael Ulrich who, like Rachel, has a strong performance track record – especially in falling markets. We always maintain that from the outside looking in, it is virtually impossible to be sure who is responsible for the attribution of a fund’s performance. Fund houses will, not surprisingly, attempt damage (outflow) limitation through periods of manager change and they, quite reasonably, paint a positive and optimistic picture for the respective fund post change(s). Just as clients have certain behavioural biases when faced with a new situation, so do fund managers. As an example, there could be a temptation to give the new manager the benefit of any doubt regarding how a fund will be run. Often the handover is couched in terms that reflect recent performance. We have had a recent example of a new manager taking over a fund that was doing very badly performance wise and therefore the manager introduced a new approach and ditched much of the previous manager’s stock; in other words, forget the track record! Back to JOHCM UK Opportunities and Rachel is managing the fund in the same manner as when she co-managed alongside John Wood. This is a key reason we are returning to the fund. Secondly, the fund has shrunk to circa £450m from £1.8bn, so size is no longer a headwind. Though, just as importantly, outflows have slowed down and, given our visibility, the funds under management seem to be relatively stable. We have witnessed the apparent detrimental effects of forced selling many times, for various reasons and by multiple managers. We say apparent because again, from the outside, it is difficult to tell who is selling and why. We have been told anecdotally that the vultures do start to circle once it is known a manager may be a forced seller and, whilst perhaps not the most edifying spectacle, it is, at the end of the day, just business, not personal. Another factor that contributed to outflows from the fund was its removal from the IA UK All Companies sector and its inclusion within the IA Specialist sector. We pay virtually no attention to the sectors but for some fund selectors this change meant they had to relegate the fund. We aim to take advantage of other less flexible approaches to fund selection, as such we see this move as a positive in that the fund will have a diminished audience and therefore could avoid large and potentially destabilising inflows. Additionally, we are pleased to see the management of JOHCM backing the managers in their conviction toward prudent investing with an emphasis on capital preservation. We have never subscribed to the school of management harassment for holding cash within an equity fund. If, for whatever reason, the manager(s) do not feel it expedient to deploy all available cash, then we feel that within the fund’s rules it is not just their prerogative, but in our opinion an obligation to wait until such time as they feel the money should be invested. Fund selectors and retail clients alike buy funds primarily on the performance and the attributes of the manager(s) but then in some cases feel the need to try and influence the manager’s investment decisions. The analogy we would give here is a football chairman who brings in a manager based on their track record but then barges into the changing room at half time insisting on substitutions to reflect his own thinking. Is Now is the Time? Another contributory factor to the decision to bring the fund in now, is we had the opportunity in the fourth quarter of 2018 to witness how all available funds held up in the pronounced, but short lived, sell off. The JOHCM UK Opportunities fund performed very well indeed, dropping approximately 4.2% in contrast to the IA UK All Companies sector which dropped nearly 12.5%. Not surprisingly given the fund’s defensive characteristics, it didn’t perform as well as many others in the sharp snap back at the beginning of 2019, but for us that is not why we have bought it in the first place. The cash holding of the fund has oscillated between 18-30% over the last three years, but obviously there is more to the fund than its cash weighting. Since “the fund is run with an absolute mind-set both in terms of valuation and making investments irrespective of benchmark (FTSE All-Share) weightings” this almost inevitably leads the management duo towards quality names. In fact, the top 20 holdings which make up over 63% of the fund are all pretty much household names with 70% of the fund’s holdings in large cap equities. In relation to IBOSS holdings we continue to champion, as we have for over a decade, holding multiple funds in a sector and it is here that drilling down on style and fund characteristics is crucial. It’s very easy to hold multiple versions of predominantly the same thing creating the illusion of diversification, but that illusion can be shattered as well as damaging to risk adjusted returns when markets move in certain ways, such as Q4 2018. If the fund still resided in the IA UK All Companies sector it would have the lowest volatility and the second lowest drawdown and this is how we see the fund. The last piece of the jigsaw for us was another meeting with one of the fund managers and whilst we are often in London to see managers, in this instance Rachel came to visit us at our offices in Harrogate. As with the previous time we had met Rachel, we were left in no doubt about her passion, not just for investing but for this particular style of investing with the emphasis on capital preservation. The team, backed by senior management, will not be pressured into changing their style in an effort to chase the benchmark or to adhere to a third parties’ requirements, and intrinsically this is an approach we admire. As we are globally late cycle and even within the UK some sectors appearing expensive and coupled with all the macro headwinds, this fund seems particularly appropriate now, but we would hope to hold it for many years.